Detox diets are common and, while evidence for their effectiveness is lacking, proponents believe the diets remove toxins from the body. Detox diets come in many variations -- the lemonade diet, the grapefruit diet and the broccoli diet -- and they are based on eating nothing but specific juices, raw fruits or vegetables for a few days. Like many other detox diets, the watermelon diet can cause symptoms such as fatigue, headaches, diarrhea, dehydration and more frequent bouts of illnesses such as the cold and flu. During the cleanse, you eat nothing but watermelon for one to three days. 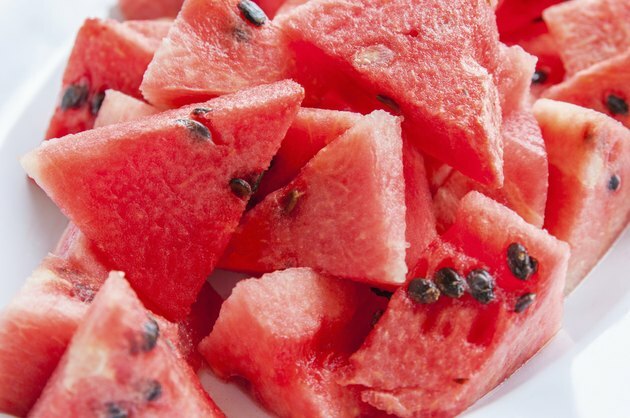 Proponents of the cleanse advise using firm, ripe watermelons that still have the seeds and, ideally, to buy organic because non-organic melons are often exposed to pesticides. If you can tolerate the taste, The Detox Specialist blog recommends using the rind of the melon along with the flesh to maximize the nutrition from the fruit. Multiple recipe ideas are available online to help break the monotony during your detox. To help make your watermelon smoothies more refreshing, try adding some fresh ginger, lemon or lime juice, and a handful of blueberries for flavor. All three of these ingredients are believed to be beneficial for the detox process, and they add nutrition to the smoothie, according to Healthy Smoothie Headquarters. To add some spice to your routine, blend beets, oranges and black pepper with watermelon. The Detox Specialist site calls this "Red Devil Watermelon Beet Soup." Although fad diets, such as the watermelon cleanse, may cause weight loss, the weight loss rarely lasts and is often regained in the long term. Fad diets are also potentially dangerous because they do not include all of the nutrients your body needs to stay healthy. The watermelon diet in particular excludes fat and protein -- both of which are essential for they body to maintain cellular health and effectively maintain and repair tissues. A better way to lose weight is to maintain a healthy, balanced diet and to perform regular physical activity. This approach will more likely lead to sustainable, long term weight loss and better overall health. Detox diets quickly lead to vitamin and mineral deficiencies, blood sugar abnormalities and muscle breakdown. They can also weaken the immune system, making the body more prone to infections and seasonal illnesses such as the flu. The diet can also cause frequent liquid bowel movements and lead to serious health concerns due to dehydration. Finally, the diets often cause lethargy and progressive fatigue due to lack of calories, headaches and worsening irritability. Health and dietary experts recommend that anyone with heart or kidney disease, pregnant women, older people and people with gastric disease avoid detox diets because of increased susceptibility to adverse health outcomes.